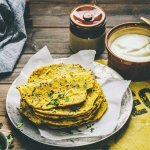 Coriander Roti can be prepared as an alternative to plain roti's with lots of coriander and spices. In a large mixing bowl, combine the chopped coriander leaves, wheat flour, chickpeas flour, spice powders, carom seeds & 1 cup of water and start kneading. Add a little more water if needed as you knead until you achieve a soft pliable dough. Splash the oil onto your hands and the remaining on the dough and knead until we have a clean bowl. Set the dough aside and prepare the tava. Divide the dough into 10 equal portions. Pick one portion of dough at a time, dust some flour and spread them with the roller into thin roti. Cook the rotis for 1-2 minutes, turning once, until lightly puffed up and lightly browned on both sides.Add few drops of oil while cooking the roti’s. Remove the Roti from the tava and place them in a casserole. Adding oil to the coriander roti is optional and you may avoid it if you are keen on cutting down oil. Serve Coriander Roti hot with Pickle, Ketchup & Yogurt. For variation, you could also sneak in some Mint leaves if you like. Adding Carom Seeds is optional again if your children do not like them included.